Hey, everyone, let me just say thanks to anybody reading this blog. I realize how obnoxious blogs can be, what with people having an over inflated sense of their own importance - so for anyone reading my own self important ramblings, thanks! Although this blog is dedicated to my comics, anyone who has been reading this knows I talk about side projects as well. Well, the bindledog guys and myself, along with the help of Zoe Triantafillou, have just finished up our latest video project. We used Zoe's fancy camera, so the quality is much better than our previous efforts. It's called Guitar Hero A-hole, and features real life GH A-hole Adam Zwirek! It's posted over on you tube, and you can check it out here. Still been working on a lot of computer work putting the pages together for Burning Building 3 and 4. I should be done shortly and have those issues finally available in print. After finishing the blog last week it occurred to me that I talk about music more than comics a lot of the time. As a means of rectifying that, I think I'm gonna skip the i-pod thing from time to time to talk about what comics I'm reading. So, I've met Ed Piskor at Space and SPX I think, and he's a cool guy that does some cool comix. 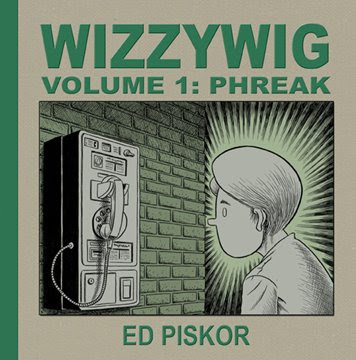 Ed self published and distributed his latest book Wizzywig Volume 1: Phreak. It's about this kid who figures out how to be a hacker/con man. This volume focuses a lot on how he hacks the phone system and learns how to get things in life via "social engineering". Ed does a great job of making the kid, Kevin, an archetype, and exploring the type of person who does this kind of thing, and why they do it. It's obvious from reading it that Ed did a lot of research and got into the mind of his character in a convincing fashion. Plus, Ed has got some mean chops! He's somehow tapped into that 60's underground comix vibe, but has a real tight and clean style that you wouldn't expect from such a young guy. I love it when I can read about a subject matter I know virtually nothing about, and get exactly what I want out of it. Ed delivers insight into the mind of his characters with a sociologists point of view that truly understands the subject matter. Can't wait for the other volumes in the series. You can order it straight from our man Ed, here. In other news. Van has been completely obsessed with me lately, asking where I am all day long, and asking what I'm doing 50 times a day... it's adorable. Here's a pic that illustrates it quite well even though it's a little old. I'm quite often storing a pen or pencil behind the ear, and as you can see, Van is an observant little guy.